The Kiani Crown (Persian: تاج کیانی) was the traditional coronation crown in the Iranian Crown Jewels which was used during the Qajar dynasty (1796–1925). The crown itself is made of red velvet, on which thousands of gems were set. 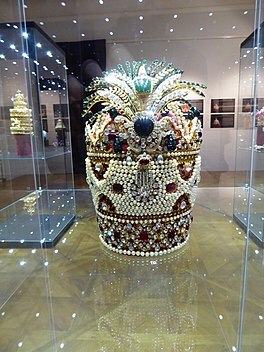 The Kiani Crown is highly decorated, possessing 1800 small pearls, many only 7 millimetres in diameter, stitched onto it. It has approximately 300 emeralds and 1800 rubies. The crown is 32 cm (12.5 in.) high and 19.5 cm (7.5 in.) wide. It is currently kept in the National Treasury of Iran in Tehran. Reza Shah, the founder of the Pahlavi dynasty, had his own Pahlavi Crown designed but the Kiani Crown was present during his coronation in 1926. Middle and New Persian kay(an) originates from Avestan kavi (or kauui) "king" and also "poet-sacrificer" or "poet-priest". 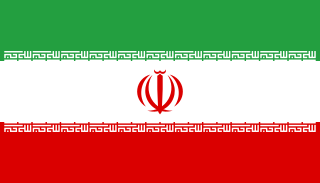 The flag of Iran is a tricolour comprising equal horizontal bands of green, white and red with the national emblem ("Allah") in red centred on the white band and the takbir written 11 times in the Kufic script in white, at the bottom of the green and the top of the red band. Reza Pahlavi is the last heir apparent to the defunct throne of the Imperial State of Iran and is the current head of the exiled House of Pahlavi. He is the older son of the late Mohammad Reza Pahlavi and his third wife Farah Diba. Shahnaz Pahlavi is the first child of the Shah of Iran, Mohammad Reza Pahlavi, and his first wife, Princess Fawzia of Egypt. Mohammad Ali Foroughi also known as Zoka-ol-Molk was a teacher, diplomat, nationalist, writer, politician and Prime Minister of Iran. The Kayanians are a semi-mythological dynasty of Persian tradition and folklore which supposedly ruled after the Pishdadids, and before the historical Achaemenids. Considered collectively, the Kayanian kings are the heroes of the Avesta, the sacred texts of Zoroastrianism, and of the Shahnameh, Iran's national epic. The Order of the Crown was founded in 1913 by Shah Ahmad Shah Qajar before his coronation as the highest dynastical and state order. Until 1926 it existed in two classes. The 1st class had a collar reserved for the Shahanshah and the Crown-Prince. The Order was preserved in Iran after the fall of Qajars. Until the reform of the Order in 1938/39 the sash was blue with thin green-white borders, but after the reform was corn-yellow with sky-blue edges.